Baklava is an incredibly sweet and wonderful dessert from the Balkans. 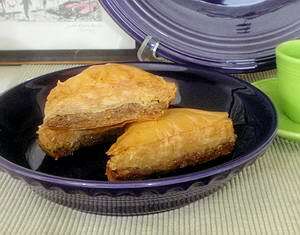 In fact, many countries claim Baklava (pronounced bahk-lah-VAH) as its own invention, including Turkey, Greece and Albania. Another country that stakes a cultural claim on this dessert is the Czech Republic. Many Czechs immigrated to central Texas in the late 19th century, forming the present-day towns of West and Caldwell. And they brought Baklava with them. Despite the Czech origins of Baklava, and the fact that Texas Cooking is celebrating German culture this month, we cannot pass up Baklava as a fabulous end to a German dinner. Baklava ranks in the highest category of sweets, along with, say, chocolate fudge, as almost overpoweringly rich and sweet. Even though Phyllo dough is used in Baklava, it is more a confection than a pastry. (The Joy of Cooking has this to say about phyllo: "The simplest of ingredients -- flour and water -- are so skillfull kneaded, rested and stretched as almost to defy amateur reproduction." Baklava contains dozens of layers of phyllo dough brushed with butter and, when baked, they turn into golden brown puffs of flaky pastry. The dough is layered with nuts and spices, then drizzled with honey syrup. Traditionally, it is cut into diamond shapes about 1" x 2" -- small for a dessert, but so sweet and rich, even one can be satisfying. Combine ¾ cup sugar (or honey), water, lemon half and orange slice in a saucepan and bring to a boil. Simmer for 15 minutes. Mixture should coat the back of a spoon. Remove from heat, take out the cinnamon stick, lemon and orange slice, and allow syrup to cool. Refrigerate. Combine nuts, 2-½ tablespoons sugar, ground cinnamon and cloves. Butter a large (at least 11" x 17") baking sheet that has a 1-inch lip on it. Depending upon the number of sheets in your package of phyllo dough (usually 20 to 24), use half of them for the bottom layer. Put down one sheet at a time, working quickly, and brush a thin layer of melted butter on each sheet. Evenly spread the filling over the dough, and top with the remaining sheets of phyllo dough, again brushing melted butter between each sheet. With a sharp knife (an electric knife works well if you have a steady hand), cut the filled phyllo dough into diamond shapes, making cuts about 1-½" apart. Cut down to but not all the way through the bottom layer of phyllo dough. Bake in preheated 350°F oven for 30 minutes; then raise oven temperature to 475°F and bake 10 to 15 minutes more, until baklava is golden brown. Remove from oven, and pour cooled syrup evenly over the top of the phyllo. Recut baklava, this time cutting all the way through the bottom layer. Makes about 8 dozen. If you've ever worked with phyllo dough, you know how quickly it dries out. While using it, keep the unused layers covered at all times with a sheet of plastic wrap and a clean damp dish towel. Some phyllo dough comes larger than 11" x 17" so if your baking sheet is no larger than that, just trim off the excess.